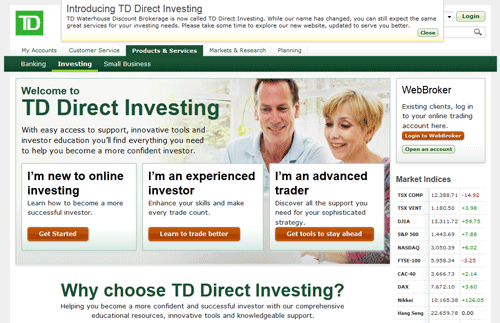 It looks like TD Waterhouse Discount Brokerage has recently rolled out its new name: TD Direct Investing. With the new name TD Direct Investing comes a much more user-friendly layout to their website, and many more pictures of smiley happy people. After waves of reports and surveys about investors requiring added support and educational resources, it seems like TD’s response is to simplify access to the large amount of material they have developed for self-directed investors. Gone are the overpoweringly excessive green and orange tabs and pages. Instead cleaner shades of green and grey, mixed in with crisp fonts and ample use of white space have made the site far easier to navigate and read. The front end of their website now provides easy login access to WebBroker, three choices for individuals to access information depending on whether one is “new to online investing”, “an experienced investor” or “an advanced trader”. Simplified website – check. Scrolling further down the page, there are four simple categories mixed in with ample adjectives. Your choices are investor education, knowledgeable support, powerful trading platforms and tools, and competitive fees. Despite sounding a bit super-hero like, rather than having to be a super-hero to find the information, the new layout makes finding things incredibly intuitive. While filled with great promise at the investor education section and the investment seminars, the excitement quickly fizzled after clicking on the links to “find seminars near you” which took us back to the duo-tone green layout and semi-functional .pdf listing of seminars. Undeterred, we doubled back to check out more of the education section. The “investor education” is a very well presented section. There are four interesting videos that made it to the landing page. On closer inspection, however, only four of the many videos are accessible directly from this page, and when clicking on any one of the videos, the user is taken back to the “green version” of the website. While not terrible, I’m sure there’s work to be done to make that experience simpler than it is now. The guides on options trading, mutual funds and fixed income looked promising however, they pointed back to some of the existing content that was less than engaging to read in the old-layout. The re-branding exercise to go from TD Waterhouse Discount Brokerage to the shorter TD Direct Investing will take some time to catch on. Credit should be given where it is due, and so while there is still some work that needs to be done on their website, the new look and feel of the TD Direct Investing website are certainly far easier to navigate and find information on than the previous version. To visit the new site, click here.